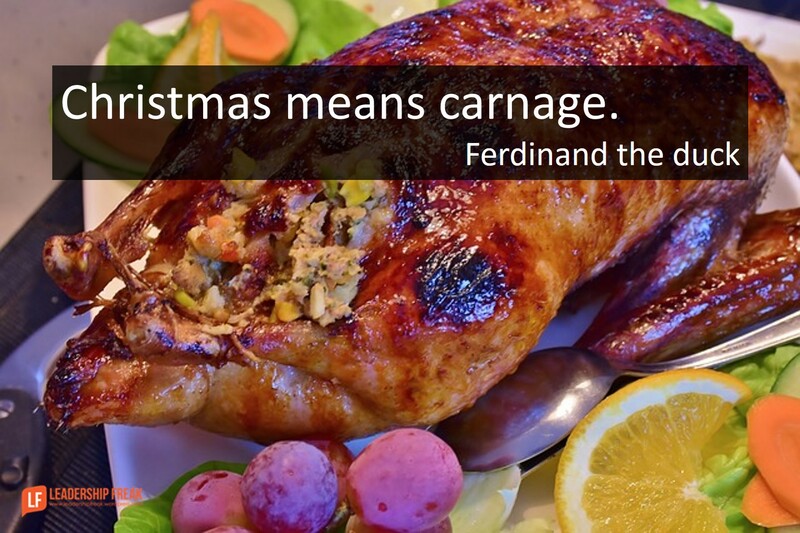 “Christmas means carnage,” Ferdinand, the duck in the movie, Babe: Pig in the City. A feast for one is tragedy for another. I hope you put an end to traditional gift exchanges in your office. Don’t have gift exchanges. Don’t force people to give gifts to colleagues and co-workers. Have lunch or dinner together, rather than exchanging gifts. Gag gifts can be a fun alternative to traditional gift exchanges in the office. Organize a White Elephant Gift Exchange. I’ve done this several times. It’s hilarious. Encourage those who want to exchange gifts with coworkers do it outside the office. If you have an exchange, set a very low dollar limit, after all, it’s the thought that counts. Strengthen internal connection by focusing generosity on outsiders. Participate in a community project. All rules have exceptions. Perhaps you’re in a small tight knit office. Maybe it’s a family business where traditional gift exchanges make sense. Even in these situations, you might consider turning toward outsiders, when celebrating the holidays together. What alternative to traditional gift exchanges might better serve the spirit of Christmas? Dan agree on not exchanging gifts with everyone. What I would do is a dinner for my staff and their significant other at my house. We would have a drink and then either a sit down dinner if the group was small or a buffet. When they left my wife would give them a holiday ornament. And I paid for all of this personally. This made it a gift. Many of my peers charged events like this to the company. Thanks Brad. Love the personal aspect of your approach. It’s relational, which feels good to me. Good ideas, except perhaps the one about encouraging gifts outside the office. It just encourages the formation of cliques based on extra-curricular activities. I’d also add an ironclad provision against gifting upward. Zero value, zero tolerance. Great ideas. Not everyone celebrates Christmas, and the gifting thing is always awkward. I love the idea of doing some good rather than spending money on things people often don’t want. Dan, Very relevant post! Thanks! I take my direct reports for lunch and pay from my own pocket. I also do not call it “Christmas” lunch because then I can take everyone with me – even the ones who don’t celebrate the festival. It allows me to get to know them outside the office. To them, the experience of being together is worth more than being stuck with a gift they don’t have any use for. White Elephant here…hilarity ensues! We also do stockings. Small items fill the stockings by season end. Small candy, pens, lip balms, hand sanitizer…things like that. IN recent years our office ether adopted a needy family or donated the amount we would spend on a gift exchange to our local food bank. My office once did a gift exchange where we drew names and then gave gives we imagined the individual would have liked as a child – and then all the gifts were donated to charity. We were a pretty close-knit group, so it was a lot of fun and further strengthened relationships as we described why we had chosen the gifts. Goofy Gift Exchange – bring a funny gift, wrapped and untagged, to exchange. The format is similar to a Yankee swap (draw numbers, pick a gift or steal something already open). Ugly gifts and regifting are strongly encouraged. All gifts are anonymous so no one will know what you bring unless you spill the beans. Come and join us – even if you don’t want to exchange gifts. Pizza will be provided for all. Please let me know if you plan to attend so I can order the right amount of pizza. Great ideas! We are doing an ugly sweater contest when we have our potluck. Just fun for anyone who wants to participate.